In this post, we will see about AngularJS inbuilt filter examples. We need to display output data in some other formats many times . For example: You need to display currency with the number. AngularJS provides many inbuilt filter for this purpose. AngularJS filters are used to format data in views. “|” symbol is used to apply filter. Lets see some of inbuilt filters here. This filter is used to change format of text to uppercase. Output: HELLO FROM JAVA2BLOG !!! This filter is used to change format of text to lowercase. This filter is used to format number into currency. 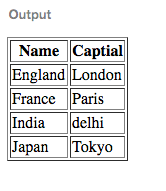 This filter is use to order by column in the table.